Cristal Ortega, 23, is sunshine personified. “I am loving life right now,” says Ortega beaming with pride. 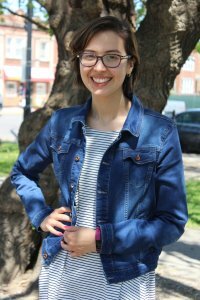 “I am looking forward to accomplishing some of my goals this summer.” Ortega, a Cicero-native and recent graduate of Dominican University, leads her life with great eagerness, compassion, and altruism. “I am always pushing my family members and my friends to go after what they believe in and what they envision for themselves. I love seeing people succeed, I love seeing people accomplishing their goals and helping others,” says Ortega. Ortega’s delightful disposition is one that is contagious. It is unfathomable to learn that just a few short years ago, Ortega endured the fight of her life. 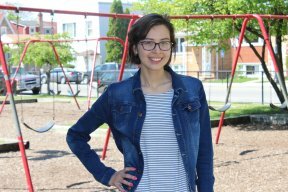 In her junior year of college, Ortega was diagnosed with Stage 3 Ewing’s sarcoma in 2014. Ewing’s sarcoma is a very rare type of cancerous tumor that grows in your bones or the soft tissue around your bones, such as cartilage or the nerves. The cancer usually affects people from the ages of 10 to 20 years old. 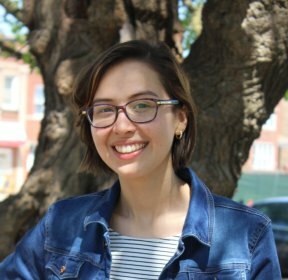 “One minute, I was a junior studying abroad in Spain, living my life, to being a young adult diagnosed with cancer,” says Ortega. “Then I went from being diagnosed with cancer, to having Stage 3 cancer, to immediately going through chemotherapy. It was a lot to process and it was a big shock for my family. I couldn’t believe that I was going through cancer, fighting for my life when it was a time for me to enjoy my life.” It’s unclear what causes Ewing’s sarcoma, as it doesn’t appear to run in families. So far, research states that it’s not related to exposure to radiation, chemicals, or other outside things in the environment. It appears that the cell DNA changes after birth, leading to Ewing’s sarcoma. Fortunately, in the summer of 2016 Ortega found herself in remission. Her goal now is to inspire as many youth affected with cancer. On June 4th, Ortega will set on a cross-county bike trek through the 4K for Cancer, a program of the Ulman Cancer-Fund for Young Adults. The Ulman Cancer Fund is a non-profit organization that changes lives by creating a community of support for young adults, and their loved one, impacted by cancer. Each year, young adults partake in the trek visiting local hospitals across the country talking to cancer patients delivering cancer kits. “I want to give my peers hope. I want them to know they can and will get through it. Just stay positive and keep fighting,” says Ortega. Nearly 70,000 young adults are diagnosed with cancer in the United States each year, according to the Centers for Disease Control and Prevention. Today cancer is the leading disease killer among 20 to 39-year-olds. Currently, Ortega is accepting donations. If you would like to learn more about her story, visit https://ulman.z2systems.com/cristal-ortega or https://www.gofundme.com/cristals-4k-for-cancer. If you would like to follow Ortega’s journey this summer, visit her at https://www.facebook.com/Cristals4KforCancer/.